Police vehicles are parked near a vocational college in Kerch, Crimea, Thursday, Oct. 18, 2018. An 18-year-old student strode into his vocational school in Crimea, a hoodie covering his blond hair, then pulled out a shotgun and opened fire on Wednesday, killing scores of students and wounding dozens of others before killing himself. Russian authorities in Crimea were searching Thursday for a possible accomplice of the student whose shooting-and-bomb attack on his vocational school killed 20 people and wounded more than 50 others, a top official said. 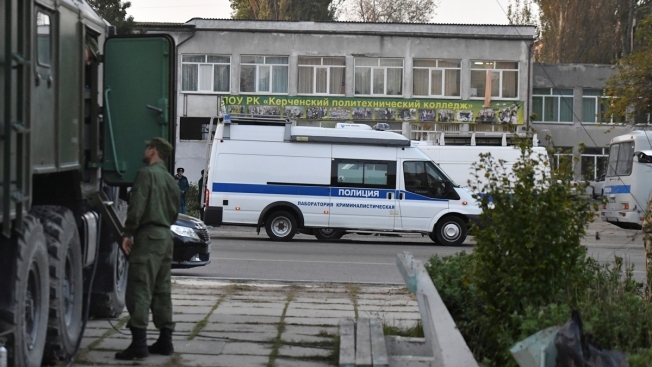 The 18-year-old student, who authorities said later killed himself in the school's library, was initially believed to be the only person involved in the carnage Wednesday at the Kerch Polytechnic College in the Black Sea city of Kerch. Authorities haven't provided a motive for the shooting. Teachers and classmates have described the attacker as a shy person with few friends. But Sergei Aksyonov, the Kremlin-appointed head of Crimea, told Russian news agencies on Thursday that it's possible the attacker, identified as Vyacheslav Roslyakov, had an accomplice. "The point is to find out who was coaching him for this crime," he said. "He was acting on his own here, we know that. But this scoundrel could not have prepared this attack on his own, in my opinion, and according to my colleagues." The Kerch attack was by far the deadliest by a student in Russia, raising questions about school security. The vocational school had only a front desk with no security guards. Russia's National Guard said Thursday it has now deployed officers and riot police to all schools and colleges in Kerch. The Kerch attack was also the deadliest school violence in Russia since the 2004 Beslan attack by Chechen separatists, which left 333 people dead, many of them children, during a three-day siege. Hundreds of others were wounded. Yet as the day wore on Thursday, neither Russian investigators nor other authorities followed up on Aksyonov's comments hinting at a wider attack plot. President Vladimir Putin even sought to portray the attack as a "result of globalization"— wider forces that were exporting bad practices into Russia. Speaking at an international policy conference, Putin compared the Kerch shooting to deadly school attacks in the United States. Russia in the past few years has seen several school shootings that authorities say were reportedly inspired by gun violence in the U.S.
Putin said the fact that teenagers get a shotgun and go on a shooting rampage means adults are failing to offer them an alternative to violence. "Young people with a fragile mental state are creating false heroes for themselves," he said. "That means that all of us, not only in Russia, but in the world on the whole, are reacting poorly to the fast-changing realities." Russia annexed the Crimean Peninsula from Ukraine in 2014. Since then, Russian authorities have repeatedly warned of a terrorism threat coming from unnamed Ukrainian nationalists as well as ethnic Tatars, an indigenous Crimean people. But despite acts of public defiance and rallies, both groups haven't engaged in any violent activities in Crimea. The death toll in Kerch climbed by one Thursday to 20 after one of the wounded died in a hospital. The first victim was to be buried later in the day. Residents brought flowers and toys to a makeshift memorial outside the school on Thursday morning. Many were in tears, struggling to speak. Dozens of attack victims remain hospitalized in Kerch, and at least 10 people with severe injuries were being airlifted to top Russian hospitals for surgery, Health Minister Veronika Skvortsova said. Most victims died from gunshot wounds, authorities said. 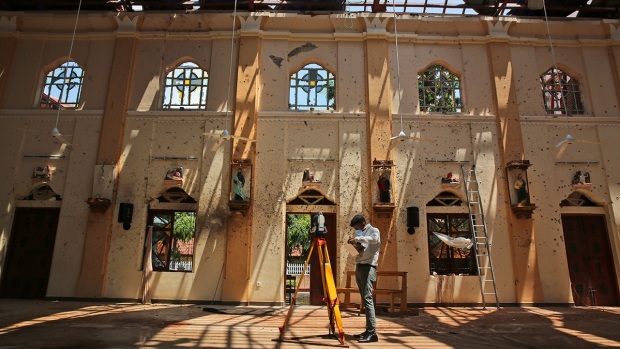 Many others had wounds from an improvised explosive device that went off packed with shrapnel. Skvortsova said some victims had their legs or feet blow off by the explosion. "The kids' muscles have been 'minced' with small metal objects," Skvortsova said. "In those who have their organs ripped apart, we are finding metal balls in kidneys, intestines, in blood vessels. That is how powerful the blast was." The young man's grandmother, Taisiya Roslyakova, told the Komsomolskaya Pravda daily on Thursday that her grandson was a kind boy who was always helping her with chores, unlike her son, the student's father, who reportedly was an alcoholic. Roslyakova said her grandson did not have many friends and spent all his time indoors, playing computer games. She said she last saw him a week ago when he stopped by and asked if he could take all the family photo albums. Russia has fairly strict gun legislation. Civilians can own only hunting rifles and smoothbore shotguns and must undergo significant background checks. Roslyakov had only recently received a permit to own a shotgun and had bought 150 cartridges just a few days ago, according to local officials. Asked about possible plans to further restrict gun ownership in Russia, Kremlin spokesman Dmitry Peskov said the government would wait first for the results of the Kerch investigation.